This is an exclusive first look at Sport Kings Series E that will be released later this year. 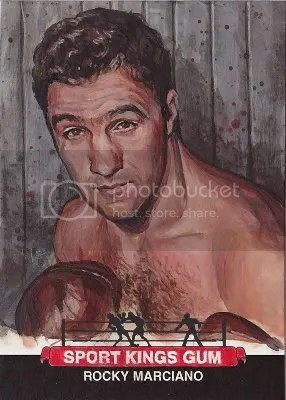 This Rocky Marciano painting is just one of many that Jared Kelley created for Sport Kings Series E.
Jared Kelley is considered one of the most influential artists within the trading card industry. He is currently the Lead Portrait Painter for Sport Kings, LLC and is the man behind many of those Upper Deck Goodwin Masterpieces containing beautiful hand painted portraits of the nation’s Presidents. Collectors have really reacted to his work, and I think its safe to say he will be involved within the hobby for many years to come. Mr. Kelley was nice enough to take the time out of his busy schedule and answer a few questions about his artwork and his involvement within the trading card industry. I hope you will enjoy! What is it about portraiture that you find so interesting? I like the challenge the most! I don’t know if every artist is like me, but I have always been entertained with puzzles; crosswords, sudoku, Rubik’s Cube, chess, riddles, etc. Portraits provide me with the same level of entertainment, if not more so. When an artist paints a portrait, he doesn’t start by painting an “eye”. He starts by painting a shape. Every inch of the model is composed of nothing more than shapes. The bone structure, the shadows, the folds in the clothing, are all simple geometric equations that are noticed and solved in the artist’s perception. Many people are surprised to know how well they CAN paint when they are taught to think in terms of shapes, and not objects. It’s a great puzzle that the artist pieces together and this is what I find so fulfilling. Very similar to the sense of accomplishment most men experience when they’ve finished assembling a bookshelf from Ikea and notice that they only ended up with 3 critical pieces of hardware that were overlooked and no more. When capturing an individual’s portrait, what do you find to be the most difficult part of the painting process? When you understand that a portrait is essentially a puzzle with varying numbers of pieces, then no painting is difficult because it’s a “portrait” per se. The difficulty for me is more in determining how many “pieces” the puzzle will require to be complete. This is always a case by case situation and can be affected by deadlines, time constraints, ability to focus on any given day, and of course the person posing. All of these elements can affect the production of a portrait. If a portrait seems “difficult” on any given day, I find that an added measure of shear determination is the best remedy. The work’s gotta get done; no excuses! If you would have had instructors proficient in portraiture, how do you think your work might differ from what it is today? I work in acrylic for a few reasons. First, when I was a younger newlywed and just starting out in life, my work space was essentially an apartment broom closet. For that reason, the smell of oils and solvents wasn’t very appealing to have in the home, so I started to lean heavily towards acrylics because of their non-toxicity and solvent free clean-up. If I had the opportunity, I would have loved to have had instruction on traditional portraiture using oils. Though acrylics have come along way since their advent in the 50’s, nothing replaces the body of an oil paint. I would have loved to learn the uses of the various oil mediums and the best techniques for layer applications, none of which was taught to me in college. Bummer. Since becoming involved in the trading card industry, what has been your favorite miniature sports art project that you have worked on? Why? Without a doubt, unequivocally, the Sport Kings Series E set that I am currently doing. I started painting my first sketch cards back in late 2010 for Upper Deck. Since that time, my comfort level for working in small scale has greatly increased. Also, as with everything in life, I’ve learned by experience what works better when creating these little masterpieces. Since I signed on with Sport Kings Gum, LLC (www.sportkingsgum.com) I have employed new techniques that have taken these latest cards to a higher level of excellence. The Sport Kings series will be well worth the high dollar amounts that each painting will surely sell for at auction. I love adding little “extras” to the cards to help increase the rarity factor for the collectors. For example, in the Upper Deck Goodwin Masterpiece paintings, some of the backgrounds were different than others and, in the case of the George Washington cards, there were singular pieces of glitter embedded into the eyes of Washington so that the card sparkled slightly when the collector held it. Of course, collectors have noticed that I choose to gold leaf the edged of my favorite cards. This tradition will be maintained in the Sport Kings paintings, which will feature gold edges on every portrait since no painting will have multiple copies offered. Just 1 of 1’s. There will be plenty of additional “extras” amid the cards in this set. I’m very hyped to see the market’s reaction to such a great set of cards. Is there anything special you have to keep in mind when working on a project for a trading card manufacturer? Deadlines, deadlines, deadlines!!! Since each project entails its own set of circumstances, and given the fact that I am still very fresh to the sketch card scene, the biggest learning curve for me is simply calculating the time needed for completion. There’s no real science to determining the time you’ll need to hand paint such a large number of cards. When you’re trying to figure it out it can feel like throwing a dart at a board while you wear a blindfold and praying that you hit the bull’s-eye. Obviously you’re going to have to adapt to circumstances as you embark on the project. For me, I would estimate that a card takes 3-4 hours each to go from blank stock (nothing but graphics on the back and bottom front) to finished product. Now, multiply those hours by 500 and you’ll start to appreciate the effort that goes into such a high caliber product. What upcoming projects within the trading card industry are you currently working on and look forward to seeing hit collectors’ hands? Why? I plan to work on the subsequent “Series” editions for Sport Kings. I was strongly drawn to Sport Kings preservation of and loyalty to artwork in their products. They are a growing force in the trading card world and I hope to stay onboard their ship for years to come. The degree of excellence to which Dr. Brian Price (Owner/CEO) aims for all of his products, including the In The Game and Famous Fabrics sets (www.itgtradingcards.com), (www.famousfabrics.com), is what I admire most and hope to emulate in my work. When a collector pays $3000 for one of my cards I want that collector to feel confident that he/she just secured a quality product which will only increase in value as time rolls on. Looking back, what are some of the more memorable pieces of work that you have done? Why? I am a huge American History buff and love patriotic themes. The chance to paint the Founding Fathers for the Upper Deck set was a thrill! I have to say, however, my favorite sketch card painting thus far has to be the trophy Washington Card, which Famous Fabrics will be giving away to the first collector to acquire all 96 cards in the 1600 Pennsylvania Avenue set just released in late February. The biggest difference in that piece is the story being told in the background. By far, it’s the most detailed background I’ve painted on a card to date, though some of the Series E cards will have similarly active backdrops. Are you a collector? If so, what do you collect? I don’t collect anything besides plaque in the arteries and scorn from my two cats. This has been part of the excitement for me upon my introduction to the hobby. Apart from the cool experience of painting on a trading card, I’ve had the pleasure of meeting some really awesome collectors who have turned into good friends. I’ve been so touched by the warm fanfare given to my work in the hobby, that I have even featured the names of supporters in several of the Series E portraits. It’s my way of expressing my appreciation for the collectors. I will admit to “breaking” my first two boxes of cards when the Goodwin Masterpieces came out. I’m sure I’ll be doing the same with each new release from Sport Kings. Who knows, I may become a full fledged collector yet! In the end, I love what I do!